First let’s start by defining binary search. Using D&C (Divide and Conquer) we break the problem recursively into smaller subsets, until we find what we are looking for. Let’s take for example the array below. So in the array above we’re looking for the number 76. We start by finding the middle element of the array, that breaks our array into two subsets. Next we take the right half (from m to array.length - 1) and find the middle element of that half. Then the steps above are repeated recursively, until you find what you are looking for. 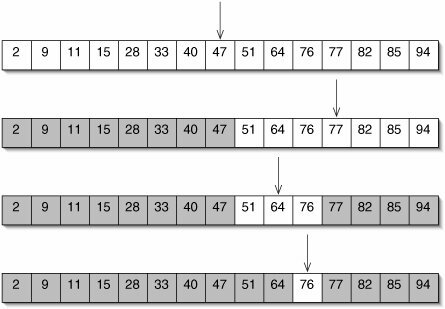 These are the basics of how binary search works and is exactly how bisect in Git works. Let’s say these commits are multiplied by 10 so instead of 17 commits we have 170. I know for certain there is a bug in the code, but I want to know where it came from and who introduced the bug. We can easily find out with git bisect. Then you’ll see something like (master|BISECTING) which tells us we’re in bisect mode on master branch. Now let’s go back and find a commit where the bug hadn’t been introduced. We know for certain that commit e83ce7c didn’t have the bug because that was our initial commit. When Git takes you to a step, Git automatically checks out that commit so all you have to do is to check whether the bug is present. After going through each step, Git will then find the first commit that introduced the bug and tell you the author. But Git won’t tell you where in the code the bug is. But you can easily track that down when you’ve found the bad commit and the culprit who introduced the bug. When you’re done, just type git bisect reset and Git will go back to the previous state before entering bisect mode.